THE FRIENDS OF CEDAR GROVE CEMETERY WAS OFFICIALLY established in February, 1981 to provide help with improvements for the Cemetery. In October of 1980 the original group of three founders (Marie Caruso, Mary Cobb, and Lucille Croughwell) met with three more devoted people (Robert Jepsen, Virginia Van Der Meulen and Thomas J. Whelan) to become the core of the organization. Their first major fundraising effort was to obtain a permanent set of chimes, an organ, pews, kneelers for the choir loft, and kneelers for the existing pews on the main floor of Gilman Chapel. 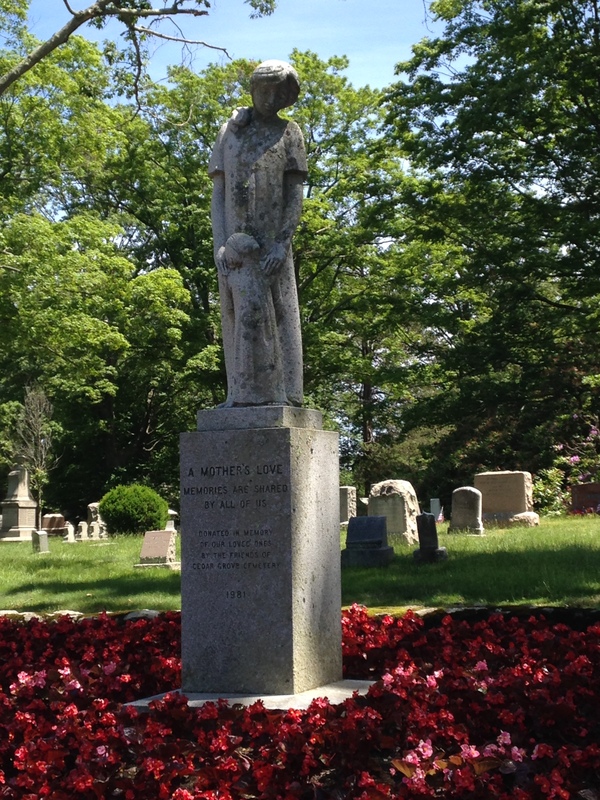 For this, the Friends approached the Cemetery’s Board of Trustees with a proposal which was approved, and the Friends immediately set about seeking donations. Cemetery lot-holders were contacted by Mrs. Van Der Muelen’s committee and the response came in the form of more than $10,000 from nearly 500 contributors. As a result, a used Baldwin organ was acquired, several new pews were donated as memorials and placed in the choir loft. Kneelers, presented to the Cemetery by St. Brendan’s Church, were attached to pews throughout the Chapel. And to this day, chimes ring out upon the arrival of every funeral as well as at Noon, 4pm, and 8pm daily. Details of this effort were coordinated by Francis P. Croughwell, Cedar Grove’s superintendent. The Friends also commissioned the statue by Frank Gaylord titled A Mother’s Love — Memories Are Shared by All of Us. This ambitious effort by the Friends resulted in a beautiful sculpture depicting a small child looking upward to a loving mother. The statue, which stands 4 feet, six inches above its 36 inch inscribed base, was unveiled by nine-year-old Anthony Sutliff following an ecumenical blessing by Rev. James K. Allen of the First Parish Church of Dorchester and Rev. Charles Howard, formerly of St. Brendan’s Church of Dorchester. Today, the Friends of Cedar Grove Cemetery continues their work for the Cemetery, helping in a wide variety of ways with projects and the Cemetery’s needs. A Mother’s Love — Memories Are Shared by All of Us. Sculpture by Frank Gaylord. Click on the image for an enlarged view. 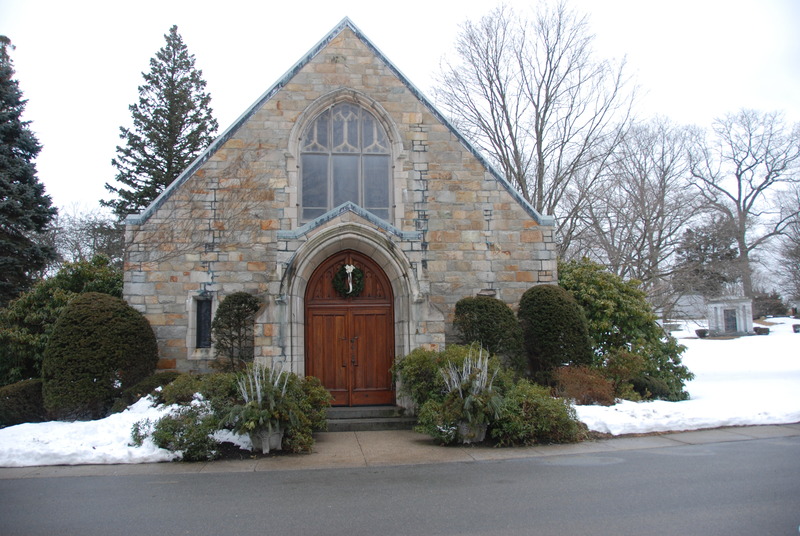 Eugene A. Gilman Memorial Chapel. Built 1931. Click on the image for an enlarged view.